Pop Quiz: Which industry is the second largest polluter in the world, next to Big Oil? Answer: You’ve surely guessed it from the title of this post: the clothing industry. (source: ecowatch.com). Learning this came as a shock to me and I’m guessing it does to you as well. Many of us jump at the chance to get a great deal on new clothing. We get tired of the clothes we already have and want to sport a fresh look. We also want to keep up with trends (“Ew, that shirt is SO 2016!”). News flash: You didn’t save anything. Retailers factor all of their discounts, coupons, and loyalty rewards into their prices at the outset. They still turn a profit even while you’re enjoying your 30%, 40%, even 75% off. Why do they offer such steep discounts? Psychology. You will spend more money when you feel like you’re getting a great deal. Most consumers assume it’s okay to buy clothes they don’t need, because donating their “old” clothes will benefit others. There’s one problem with that assumption: there are way more gently used clothes than there are people to buy them. On top of that, “fast fashion” chains manufacture so much poor-quality clothing that thrift stores can’t move it off their shelves. That’s right: the resale value is so low, even thrift stores won’t touch it. Thrift stores are inundated with unwanted goods. I’ve seen this phenomenon firsthand. Twice in the last few months, I’ve taken castoffs to more than one local thrift store only to see the sign: “Sorry, we are not taking donations at this time.” Don’t believe me? Check out this disclaimer from N Street Village, which provides services to low-income and homeless women. “Due to overwhelming support, we are longer accepting clothes under size 18 and high heeled shoes.” According to the CBC, at the Salvation Army, “clothes have four weeks to sell before they’re replaced by the next wave of donations”. As more people discover The Life-Changing Magic of Tidying Up and haul ever-bigger loads to their nearest donation centers, this problem will only grow. Long story short, thrift stores try to sell only the very best castoffs. They wrap many of the rest into huge plastic bundles and send them overseas. This is another common excuse for justifying the over-consumption / donation cycle. If there aren’t enough Americans in need of used clothes, then surely all those poor people overseas can use them, right? In many ways, the fast-fashion industry perpetuates the cycle of poverty instead of alleviating it. The book Clothing Poverty: The Hidden World of Fast Fashion and Second-hand Clothes offers an eye-opening account of how the industry and second-hand clothing markets make it harder for people in the Global South to overcome economic inequality. Some East African countries have even proposed a ban on used clothing imports. “In Kenya, they are called the ‘clothes of dead white people.’ In Mozambique, they are the ‘clothing of calamity.’They are nicknames for the unwanted, used clothing from the West that so often ends up in Africa.” An Oxfam report found that up to one-fourth of secondhand clothing imported in Kenya couldn’t be sold due to poor quality. On top of that, modern slavery and human trafficking plague many segments of the fashion industry. We sometimes unknowingly support slavery in our shopping choices. You can find out more in the book Slave to Fashion as well as the author’s website. Needless to say, by cutting back on new clothing purchases you’ll also reduce your contribution to the problem. If you want to fight poverty, you can make a much bigger impact by taking a pass on that next great deal and donating that money to charity instead. 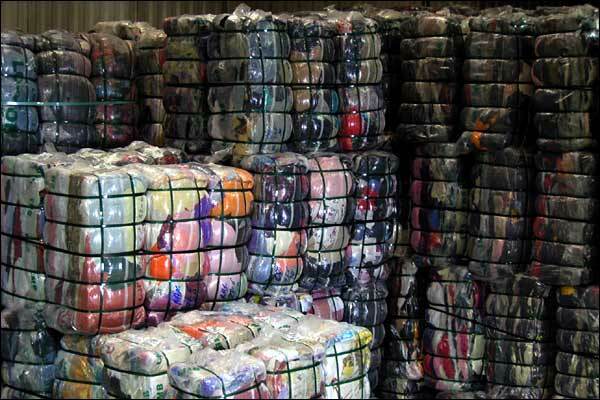 You may have heard about “textile recycling”. You may have even dropped some bundles into a nearby parking lot’s clothing recycling bin. Unfortunately, there’s still a long way to go before recycling becomes viable. For now, it only serves to delay the inevitable: in the end, all old clothing winds up in a landfill. Granted, recycling your clothes is better than tossing them straight into the dumpster. But of the three R’s – reduce, reuse, recycle – recycling is a measure of last resort, not the first line of defense. At this point, the solution may seem obvious: stop buying clothes you don’t need. You’re on the right track, but you can step it up a notch or ten. Answer: The ones you already have. I challenge you, dear reader, to stick to a new-clothes-purchase ban for ONE YEAR. Level up by challenging a friend to join you. Instead of buying new clothes, wear what’s already in your dresser and closet. You have all the clothes you really need. If you really have nothing appropriate to wear, search eBay or your local thrift store. Chances are you’ll find something almost brand new, and at a much lower price. Or borrow that fabulous dress hanging in your friend’s closet. It deserves a night out too. Trust me, I get it. One week their pants are too long; the next, they look like they’re waiting for the flood. All the more reason to buy used! Guess what? eBay and your local thrift store have tons of great clothes for them too. Better yet, make fast friends with a family whose youngest child wears a size or two up from your own’s. Offer to pay them fair market value for whatever their child outgrows. It saves them from the hassle of hosting a garage sale. It saves you from the hassle of shopping, and from the temptation to overbuy. Now befriend another family whose oldest child wears a size or two down from your youngest. Offer to outright give them your kid’s hand-me-downs. Accept nothing in return – just the promise that they’ll pay it forward and pass their used clothes along to someone else. Congratulations! You’ve started a chain of reuse that can keep going. After your year is up, make a list of clothing you absolutely need to buy for regular use. Then select only high quality, timeless pieces – nothing that will fall apart or go out of fashion within the next two years. The average American discards approximately 80 pounds of used clothing per year. But you are not average. You are doing your part to become SuperGreener, save money, and save the planet. Thanks for reading, and for taking the next step to becoming SuperGreener! Multiply your impact by sharing this site with your friends. I’m confused about the use of the term slavery in this post as I didn’t see any reference to sweatshops or actual slaves. Thanks for the feedback, Madison! It was meant to be a play off the expression “slave to fashion”, as in we personally need not be slaves to fashion. But you’re right that literal slavery in the fashion industry is a very real problem. I’ve expanded the “Third World Country” section above to include that concern.